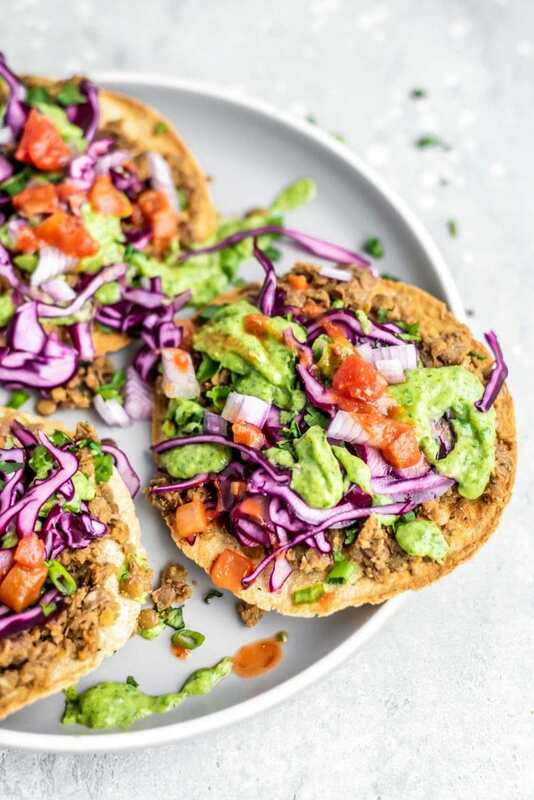 When I was traveling in Central America, one of my favorite street foods was tostadas of all shapes and sizes. 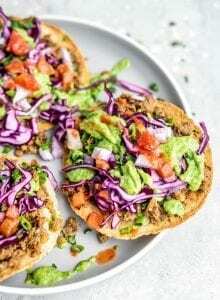 This recipe for vegan lentil tostadas is inspired by my time in those beautiful countries. 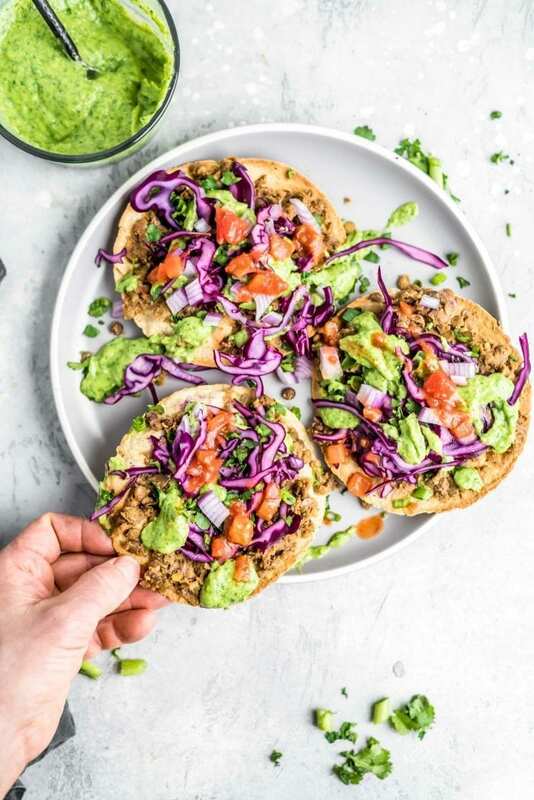 These are easy to make with everyday ingredients and make a delicious and filling plant-based meal. 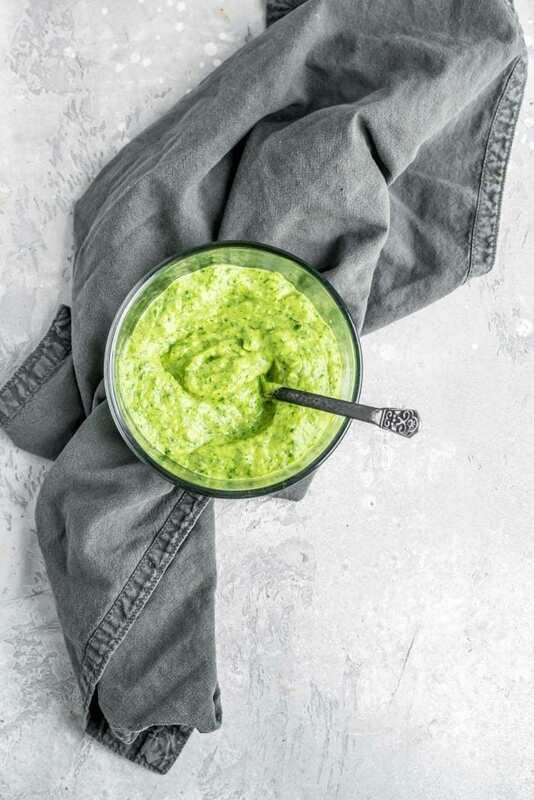 This avocado sauce is always a good one to have on hand for dipping, as a spread or adding to dishes for a burst of fresh flavor. I don’t typically measure this sauce but I did today, just for you! Feel free to adjust as needed, you can’t really go wrong, it always seems to come out delicious! Avocado sauce is easy to make and tastes great. It’s basically a thinner version of guacamole. 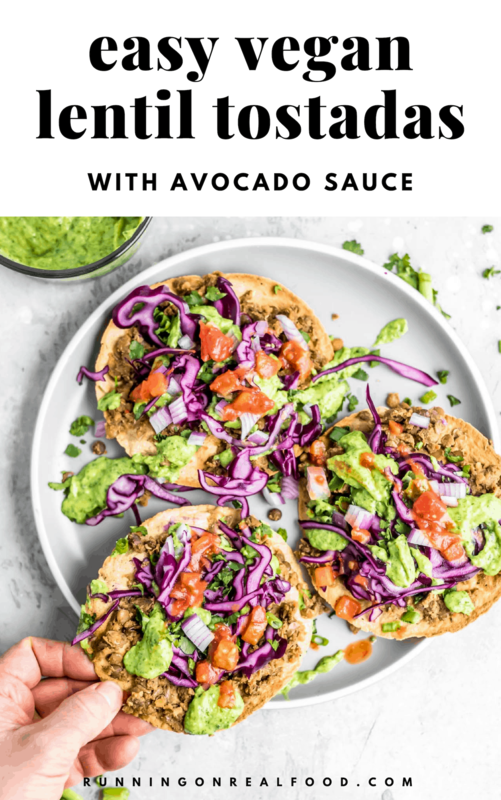 To switch things up, you could also make these with your favourite salsa, my vegan queso sauce or chimichurri sauce. Any combination of those would also be amazing. As far as the spice for the lentils, you could use a fajita seasoning mix, but I like to just make my own. I find the store-bought mixes are very high in sodium and you can easily make your own with common spices. I use a simple combination of chili powder, garlic, paprika, red pepper flakes, cumin, salt and pepper. It’s a bit spicy so adjust the amount of red pepper flakes as needed to suit your taste preference. Make sure you crisp up the tortillas before you add the toppings or they’ll end up with soggy tostadas. To crisp them, place them in the oven and broil until they’re browned and crispy, that way they’ll work as a sturdy base for the lentils and other toppings. After they’ve crisped up, place them on a baking tray, add your toppings then place them back in the oven for a final crisping. My favorite tortillas are made by La Tortilla Factory. They’re thick and soft and have the best flavor. If you can get your hands on the green chile ones, go for it. They’re so good. 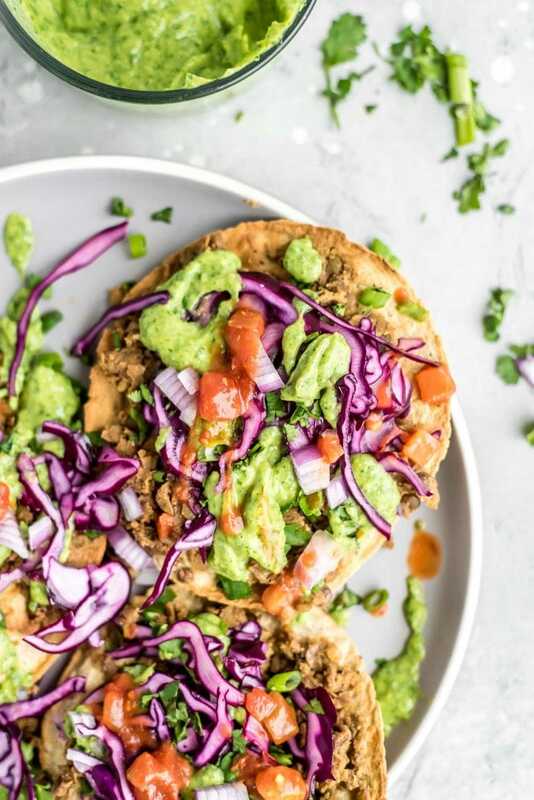 If you can’t find those, any corn or wheat tortillas will work and if you don’t feel like making tostadas, these are delicious as tacos or burritos too. What Kind of Lentils to Use? You can use cooked green or brown lentils or canned lentils in this recipe. To cook green or brown lentils, which are my preferred choice for this recipe, bring 2 ¼ cups water to a boil and add 1 cup of lentils, reduce the heat to light simmer, cover and cook for about 20 minutes until the lentils are tender. In a pinch, go ahead and use drained and rinsed canned lentils. 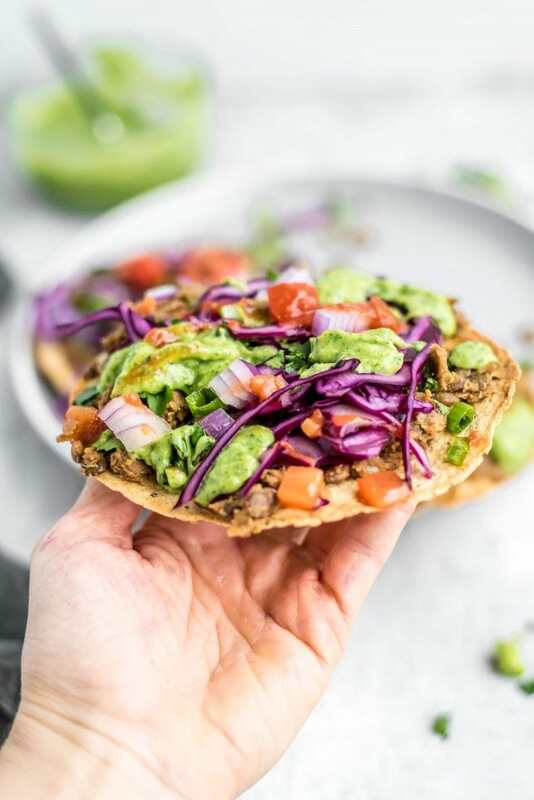 This recipe works well as written for tostadas put you can also pile the ingredients into crunchy taco shells or soft tortillas to make tacos. They’re also really good as mini quesadillas or burritos. To make burritos, use large tortillas, fill them with toppings and fold them up to make a burrito. This was amazing! Kind of a lot of bits and pieces to put together, but totally worth the time and effort. My entire family (including two teenagers who prefer meat) devoured it. If teenagers liked it, that’s a win in my books!! 😉 so glad you guys enjoyed them. First of all the photos for this recipe are beautiful! Second, what a great recipe! So easy and so delicious! Thanks!! These are so good…super easy if you prep the lentils and sauce ahead of time too. This was amazingly tasty! Thank you for giving me a lentil recipe that I actually enjoy!